In the last episode of the podcast we talked about using YouTube Annotations to Your Videos which to get more subscribers to your channel. Today's tip is about using YouTube Playlists to get more views on your videos. You can create YouTube Playlists to organize related videos into a collection that you want to promote to your audience. 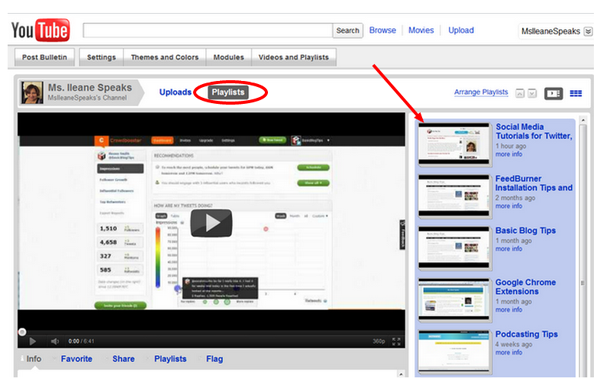 You can also embed playlists on your blog just like you do individual videos. 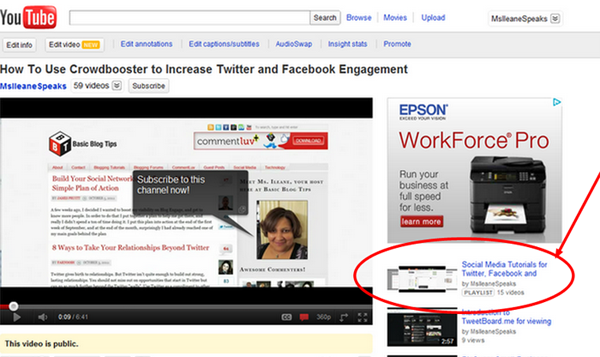 Explore the flexibility of YouTube Playlists and use them to your advantage. One thing I noticed when I took a look at my Social Media playlist is that I could do a better job with the titles I'm using, which in turn will make my video much more easy to find in YouTube searches and on Google. Check out this post for more YouTube Video Marketing Tips and techniques. Be sure to subscribe to my YouTube channel and follow my Audio Podcast on MixCloud.